Sometimes, ideas that might seem good and inspired turn out very wrong. When this happens to criminals, it tends to blow up in their faces in spectacular and humorous fashion, and that is just what is happening with a longtime criminal named Dennis Jackson. Jackson had what he thought was a good idea. 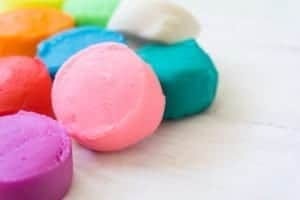 He utilized Play-Doh, one of the most iconic toys of childhood for decades, as a way to get around the anti-theft devices that are used in various stores. He took his “expert skills” to a Walmart located in Leicester, Massachusetts. He used the Play-Doh to cover the antitheft devices that were on items he wanted to steal. He believed that this was a good idea and that it would somehow disable the device. The Play-Doh did not get around the security device – and it’s unclear exactly what he thought was going to happen. He fled the scene quickly, leaving behind the item that he was attempting to steal. In fact, the Play-Doh was left behind along with something else. He actually left his fingerprint in the Play-Doh. The police had to do very little to get the print, as it was literally staring them in the face. The police took the print and ran it through the Automated Fingerprint Identification System (AFIS) in Massachusetts. However, there was nothing that came up in the state. Still, the story had gotten quite a bit of attention online, and it led to the print being seen by someone who was working for the Connecticut Forensics Laboratory. The employee then submitted the print to the national AFIS database, and there was a hit that lead to Jackson. This was not the first time Jackson, 55, had done something that was against the law. In fact, even though he had not gotten into trouble and been fingerprinted in Massachusetts before, he was quite well known to police in other states. At the time his prints were submitted and his identity was discovered, the police did not have to go very far to apprehend him. Jackson was already in custody at the Worcester County House of Correction. Not only that, but he also had outstanding warrants in other states – NJ and PA. In all, there were 129 entries on his record. He now has some other charges to add for removing an antitheft device. It seems as though Mr. Jackson has had quite a bit of trouble staying out of trouble with the law. It’s amazing to think that it was Play-Doh and the Internet that helped to find Jackson and to hold him accountable for his crimes. The Internet and other types of technology have helped to play a role in the apprehension of a number of criminals in recent years, and it is likely that this trend is going to continue. However, this is quite likely the first time that a criminal has left their print in Play-Doh.